Reading the Fantastic Four comics from the start. A few issues back, Reed “died” while fighting Dr. Doom, so in issue #384 we meet his replacement. Baskin-Robbins always finds out. Our heroes return to headquarters from Latveria to discover Sharon Ventura is missing. Sue checks the security cameras, only to reveal that whoever abducted Sharon erased the footage. 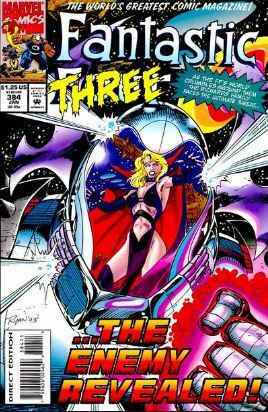 (We the readers know that she was abducted by Klaw back in issue #382. There’s also reference to part of Four Freedoms Plaza being destroyed during the Infinity War crossover, with Sue saying that the banks won’t lend the FF money to repair the building since superheroes are considered a risk. There’s another debate about Reed, with Ben and Johnny mourning Reed’s death while Sue insists that Reed must still be alive somewhere. In walks Scott Lang, whom Sue introduces as an electronics expert from Stark Industries. She has hired him to help fix up the damage to Reed’s equipment. We at home know that Scott is secretly the new Ant-Man. Johnny, meanwhile, checks in on Lyja, who is waking up from a nightmare. She says she has something important tell him, but then says it can wait. Out in New York City, Franklin, who is now a teenager thanks to some traveling, contemplates the post-apocalyptic future he’s come from. He reaffirms that his grandfather Nathaniel sent him back to this time to defeat an enemy, although Nathaniel hoped to send someone else in Franklin’s place. This enemy, Franklin learned last issue, is his own mother. He dons his Psi-Lord armor, saying that Sue is destined to destroy civilization if he doesn’t destroy her first. Sue shows Scott around Reed’s lab, with special attention shown to the computer the FF swiped from Latveria last issue. Then Franklin bursts in and attacks. Sue fights back, still believing that this Franklin is not the real Franklin. 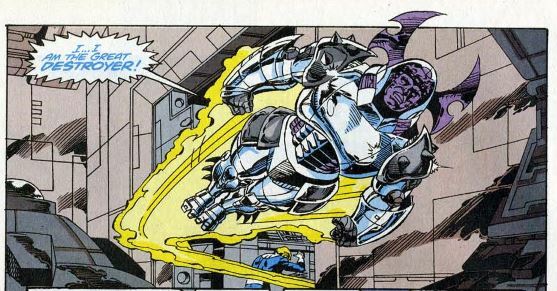 She fires “invisible missiles” at him, which fail to penetrate his psionic armor. Sue also seals off the lab, so the battle does not harm Scott. Ben, Johnny, and Lyja all cannot penetrate the lab’s super-strong door. Then Scott pulls out the Ant-Man helmet and says, “Maybe I can help.” He of course shrinks to tiny size to infiltrate an itty-bitty opening in the door. Ant-Man manages to throw just the right switch inside the door machinery, and the door opens. Once inside, Franklin attacks the FF. It’s not spelled out in detail, but the idea is that Malice has now possessed Franklin. He says he has seen the true face of the enemy, announcing that he, Franklin, is the great destroyer. He summons his psi-armor and flies off. Sue, not reacting at all to Ant-Man being there, says a “monster” has taken control of Franklin, with the power to obliterate all life on Earth. Fade out: With every appearance of Malice, it gets more and more confusing trying to sort out just who or what Malice is. 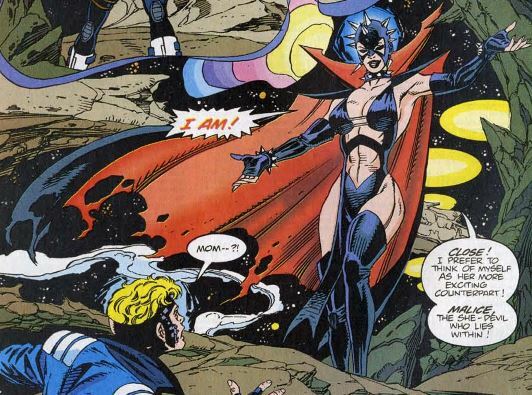 My best guess is that the first time we saw Malice back in the John Byrne days, she was indeed a representation of the dark part of Sue’s mind. These subsequent appearances, however, appear to be a new character, a psychic entity attaching itself to Sue’s psyche and calling itself Malice. Clobberin’ time: Ben goes for a walk in New York on one page, without his metal helmet. We see his face is no longer slashed and exposing sensitive skin underneath, but is instead merely deformed. Many fans over the years have interpreted this as the first step toward the end of his “metal helmet” phase. Flame on: It’s suggested that Johnny could burn his way through the sealed door to Reed’s lab, but he doesn’t when Ben reminds him of the destruction he caused at Empire State University several issues back. Fantastic fifth wheel: Welcome to the team, Ant-Man! Scott Lang is of course the second Ant-Man, taking over the title from the original, Hank Pym, who had gone on to become Yellowjacket at the time. After appearing briefly as a security expert in Avengers #181, Scott’s origin story was told in Marvel Premiere #47-48. Similar to the Ant-Man movie, Scott is an electronics expert turned petty thief who stole the original Ant-Man suit, only to use it to take down a corrupt (and super-powered) businessman. 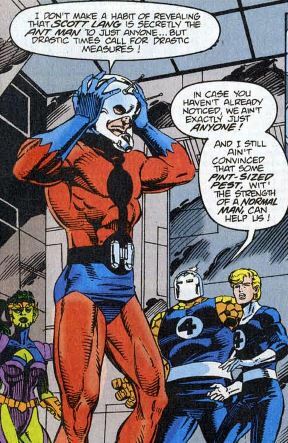 Pym saw the good in Scott and let Scott keep the suit, making Scott a regular fixture in the Marvel universe ever since. Also, this is more or less a wrap on Sharon Ventura. This comic was published in 1994, and her fate won’t be revealed until the 2000s. Four and a half: We get a little more info about where Franklin was up to during his time traveling and how his psionic powers work. Also, some readers suspect that those circuitry-looking bits on Franklin’s face might be the Legacy virus, which was a big deal with the X-Men for a long time. If Franklin has the Legacy virus, it doesn’t seem to be slowing him down a little. The Alicia problem: Lyja’s dream has her fighting Paibok the Power-Skrull, with him calling her a traitor to the Skrull empire. She then dreams Paibok killing and beheading Johnny. 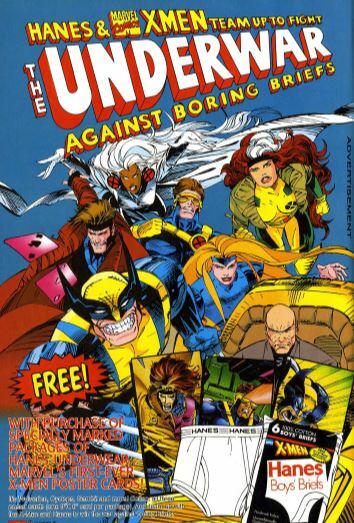 It’s the extreme ‘90s! Trivia time: This isn’t the first time Scott Lang has met the Fantastic Four. He worked alongside the FF to rescue Ben from the Microverse in Marvel Two-In-One #87. Scott didn’t reveal his secret identity to the FF at that time, though, and Ben says he learned there was a new Ant-Man thanks to gossip at one of his poker games with the Avengers. Scott then fought alongside the FF again in Marvel Two-In-One #96, during the big heroes vs. villains brawl that occurred while Ben was in the hospital. Finally, Scott and the FF both appeared in the groundbreaking Death of Captain Marvel graphic novel, though they’re not shown interacting. Fantastic or frightful? Here we have a new team member and a heel turn for Franklin, yet it all seems like it’s going through the motions. I did a little reading ahead, and the comic is going to be like this for a while, so let’s all settle in and ride it out.